While Gintoki Sakata was away, the Yorozuya found themselves a new leader: Kintoki, Gintoki's golden-haired doppelganger. In order to regain his former position, Gintoki will need the help of those around him, a troubling feat when no one can remember him! Between Kintoki and Gintoki, who will claim the throne as the main character? In addition, Yorozuya make a trip back down to red-light district of Yoshiwara to aid an elderly courtesan in her search for her long-lost lover. Although the district is no longer in chains beneath the earth's surface, the trio soon learn of the tragic backstories of Yoshiwara's inhabitants that still haunt them. With flashback after flashback, this quest has Yorozuya witnessing everlasting love and protecting it as best they can with their hearts and souls. 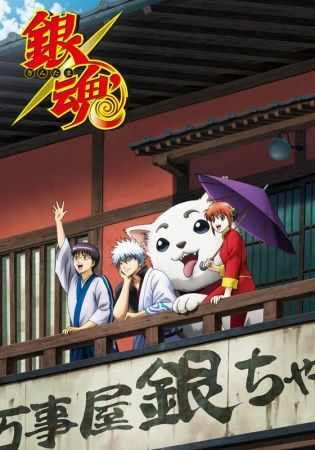 Gintama': Enchousen includes moments of action-packed intensity along with their usual lighthearted, slapstick humor for Gintoki and his friends.